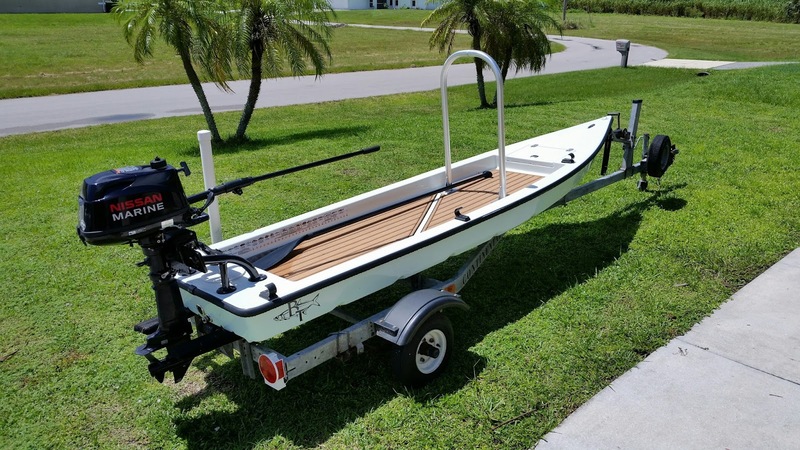 I'm selling my 2015 Beavertail Ambush solo skiff with its matching 6hp Nissan 4stroke outboard and Continental trailer. The boat and motor are in new condition with less than 10 hours of actual running time. Extras include a full Seadek teak cockpit liner, aluminum grab bar, push pole holders and powder coated motor mount. The 13' Ambush is a seriously fun fishing machine that will float in less than 4" of water and cruise at around 15mph. This is a true solo skiff and is USCG rated for one passenger only. The Ambush combo sold new for $5600 and I'm asking $4000 firm. Please e-mail me back at gmckee1@hotmail.com or call me at 239-565-2960.